Southampton 1953. The first night on board ship (shown above) my father took me for a walk around the deck while my stepmother settled my brother and our luggage into our cabin. It was the first time we had gone for a walk together since that memorable and devastating day in London when we first joined him and my stepmother. He had mellowed in the six years since then. There was a joyous bustle and excitement everywhere we walked in these last few hours before we sailed. Since I was fourteen I was allowed to eat with the adults, which meant attending the formal dinner every night. Though this was a troopship, the elaborate routines and rituals of an ocean-going luxury liner were still maintained. 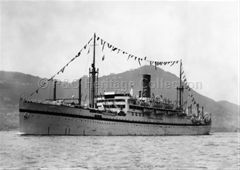 It had been a German ship during the thirties and when captured during the war, had been transformed into the military ship in which we were now travelling, though still with its sweeping curved staircases and ornate dining room, and a waiter who still processed around the corridors banging a soft gong to announce each meal. So every evening, we ate a full Edwardian dinner, course after course, in full evening dress. My father had deliberately packed his uniforms, which were now buried in the ship’s hold, so he couldn’t dress up in full regimentals. This had earned him a very black mark from the captain, to which he was impervious. All around us, other officers sweltered and swaggered in mess kit, short jackets laden with gold braid, jingling spurs and tight overalls – as their long tight trousers fitting over Wellington boots were called – while my father relaxed in bow tie and dinner jacket. With my stepmother wearing her long black silk evening dress he apologised to the others at the dining table for looking so funereal, and as he made his witty remarks, I watched the two poised and elegant young naval officers on our table fall under the spell of his debonair charm, like all his young regimental subalterns. These two young men were exquisitely mannered, especially the blonde blue-eyed one with an indefinable air of distinction, who, my father told me, came from a distinguished aristocratic family. As the voyage progressed, and we sat with the same diners at every meal and got to know each other, both these young naval officers told me what a wonderful man my father was. By then, I was old enough to see something of what they meant. He was handsome and distinguished in his own right, witty and wicked, with a mischievous sense of humour, gay and rather gentle, and exuded integrity and intelligence. Above all, he shared a zest for life, a joy in people, and a laughing disdain for authority. This was partly why we were on our way to Malaya, where he was going to help form the Federation Regiment. His career as a gunnery expert was soaring when he had complained to the Army Council about the lack of proper treatment for accidentally injured soldiers during a huge army exercise. Whistleblowers always suffer for their intransigence, so this had meant the end of his career. He left the cavalry and became an infantryman, an unusual career move! He had had a long hard war, and didn’t get away from France until two weeks after Dunkirk. His tank regiment had been ordered to support the French on the line of the Somme, but the French never turned up to be supported, and his outnumbered, outgunned regiment was in considerable peril from the swiftly advancing German army. They managed to retreat to Cherbourg, where they destroyed all their tanks and equipment, and were packed onto a cargo ship for the dangerous cross channel journey through the night. I knew where he was, because he sent little cream cards with Pharaohs on them, sitting sideways with their arms bent, with long, black hair and black, almond shaped eyes. He also sent little wicker baskets of almond nuts, perhaps when he was in Tunisia. And later, when he was in Italy, he wrote letters and drew pictures of himself drinking wine at the top of steep hills. But then, after my mother disappeared, his letters stopped coming. As though the heart had gone out of him. So I sat at table now, in the big dining room, and watched as he charmed our dining companions, who included a childless couple, he, very conscious of his grand regiment; she, still living on her memories of being ‘presented’ at court before the war, when, she told me, as a debutante she wore her long white dress with a train and two white feathers in her hair, to make her curtsey to the King and Queen at the evening courts. I wore a smart new summer dress my stepmother had bought for these occasions, but since the rest of my wardrobe was in tatters, and my only shoes were a pair of gym shoes, she lent me a pair of flat red Russell and Bromley shoes to complete my outfit. After the first week or so of this high life, I was approached by a group of young army lieutenants. They had asked my father first if they could include me in a play they were writing. I discovered that they called me Angelina, and I now enjoyed a court of charming young men who spoiled me and made me the heroine of a play they wrote and produced for the entertainment of the other passengers, so I enjoyed a brief moment of glory. But I was immune to their considerable attractions, as the night my father had walked me round the deck, I had fallen hopelessly and secretly in love with an unknown naval officer with blue eyes, standing with a group of friends having a drink in the bar. I saw him through the open window as we passed. I never knew his name or anything about him, and craned to see him in the dining room, and hoped to see him in the lounge, and never passed him on the deck. At Port Said we visited the places my parents knew for old times sake, so I never saw him there. At Aden he was nowhere to be seen, and at Columbo, as we sat and had tea at Mt Lavinia, the famed hotel by the sea, I saw he was playing tennis, and my heart turned over. When we disembarked at Singapore, and he sailed on to Hongkong, I cried for days. I must have driven my parents mad, and no doubt they put it down to hormones, since they didn’t know why I was such an emotional wreck! Sailing into Singapore in the flaming red dawn was a little like approaching Venice from the sea, and this old port was just as fascinating back then before the skyscrapers arose, and the old streets and dwellings had been razed. It was still a maze of narrow alleys, where long bamboo poles festooned with drying clothes protruded from windows high above pedestrians and trishaws, and below them, shops crammed with intriguing foods, clothes and rugs, jewellery and carvings lined the thronged pavements. We stayed in a hotel just around the corner from the fabled Raffles Hotel. Our hotel was built around a courtyard where tall palms grew and fragrant frangipani scented the air. In the warm, dark tropical night, I looked down from our bedroom windows to where knots of people squatted around the flames of tiny stoves on the pavement and cooked their evening meal… the scents of their spicy food, and the sound of their voices drifted up through the night, and they became a part of the palimpsest of this strange and enchanting Eastern city. It was still recovering from the years of deprivation, persecution, and near starvation under the brutal occupation by the Japanese during the war, but then I only saw the beauty and fascination of another culture. For a few weeks we explored the city, visited old friends in the army quarters and every day took a taxi to the beautiful Botanic Gardens in the cooler late afternoon where we fed the monkeys pea-nuts. Then we took the long train journey the length of Malaya, trundling endlessly through palms and past muddy rivers until we reached Penang, another romantic island, approached by ferry this time. We arrived in this beautiful place to another great hotel, the Runnymede, a rambling white stucco building on the edge of the sea, originally built by that splendid Georgian Englishman, Sir Stamford Raffles, as a home for his first wife and family in 1805. He’s remembered as the founder of Singapore, but he also abolished slavery wherever he was posted, established law and order and free trade, religious freedoms and free schools. He spoke Malay and wrote a history of Java and was one of the founders of the London Zoo, and London Zoological society. Typically, he was frowned on by the English government, which refused him a pension, and fined him twenty- two thousand pounds when he retired because his land reforms meant he hadn’t made enough profit from the territories he administered! It was a risky business and didn’t pay to be a just and creative colonial official! The Runnymede Hotel had been extended enormously since Raffles’ time and had evolved into one of the legendary hotels of the East, like Raffles Hotel in Singapore, and the Peninsula in Hongkong. Life for the wives in Malaya before independence – or ‘Merdeka’- as it was known, had a thirties flavour. Very little had changed since before the war in this tiny enclosed world. We spent eighteen months living in this luxury hotel on the edge of the sea which had been commandeered by the army to house officer families. So while the husbands were scattered all over the Malayan peninsula, banging off at Chinese bandits or Communist freedom fighters – depending on your point of view – in steaming, leech-infested swamp and jungle, their wives and children lived lives of bored luxury in Penang. I, of course was one of these fortunate children, and since now my step-mother’s friends had amahs to look after their children my child- amusing duties were redundant. I was at an awkward age -fourteen and a half – too young to really be included, but useful when they were short of one for canasta. Too young to learn bridge, or to be invited to join them and their friends for a pimms or gin and tonic before dinner, but too old to eat with the children. So I watched them and tried to understand the shifting friendships and social hierarchies. We’re having roast chicken on Easter Sunday, so I decided to make bread sauce, which I haven’t bothered with for years. It’s supposed to be served with turkey or partridge, but I think it’s just as good with chicken. Stick eight cloves in a peeled onion,and put it in a small saucepan with 500mls of milk, two bay leaves and two springs of thyme. Slowly bring to the boil, and then leave to infuse for at least thirty minutes. Strain the milk, discard the herbs and the onion. Stir into the milk a 100gms of fresh white breadcrumbs (I use sour dough) and slowly bring to the boil stirring all the time to make a thick smooth sauce. I make this the day before. On the day I will add 100 ml of cream, salt, pepper and nutmeg to taste. It can be thinned with more cream or left nice and thick which is how I like it. who communicates with spirits from a world that I believe is far more loving and glorious than our own. I am loving your life story…just loving it. What an adventure you are on now! As for Elizabeth Kubler Ross…we are so blessed that she took on that fascinating study! What a gift to know that the next world is far more loving and glorious than what we know now! Yes, Linda, it was precisely those words , loving and glorious that made me want to use this quote!… sounds like heaven doesn’t it !!! Every line holds a delicious sense of the past that bids us enter and share in your generous narrative. I look forward to every post. Hugs!! Still some left for tomorrow. Cannot wait to polish it. Thanks for a great and easy recipe. Love it Evelyne ! Delighted to know you tried it and enjoyed it… has made me decide to spoil ourselves and make it again for our Easter Sunday feast of roast chicken…it’s so easy, isn’t it ! I could just picture everything you described. Having been to Singapore and visited the Botanic Gardens and had (only) drinks at Raffles a few times, I could almost smell the Frangipani lingering in the humid air and the thin fingers of smoke drifting from the Satay Club… So lovely to have those memories. What an amazing life you have had, matched with a beautiful gift for sharing it. I Googled the Satay Club, not having heard of it… but I think my little groups of people squatting on the pavement with their tiny cookers were a different sort of outdoor diner! I felt they were informal groups making their own food, rather than buying from a stall…but the smells would have been delicious however they were cooked !!! Makes my mouth water just to think of that heavenly food ! I am so glad that you are writing these memories down! So good to see you, and thank you for your encouragement. No wonder you find time too short to keep up with blogs with your wonderful volunteering… what valuable work you’re doing…I always dreaded doing my own returns, and could have used your skills and help over the years! Lovely to read more of your story. Thank you Amanda, so validating to know you’re still there and reading !!! Yes, still reading, quietly in the background. Not much up to commenting yet. I have also been meaning to say that by chance I read the obituary for Pat Booth. Lots of memories there for you and another amazing period in your life. After all the hardships and deprivations during and even after the war your voyage to the fabled east must have felt like a dream come true. Your admiration for your father shows in every sentence you wrote about him. Your secret infatuation for the unknown naval officer was a heart warming tale. I am so glad, Valerie, that you were finally able to experience the brighter side of life. Thank you and Happy Easter, Valerie! As I write this Saturday evening and am close to retiring for the night you may be sitting down to your Easter dinner. I continue to enjoy your journey that you’ve so generously taken the rest of us on. I remember that awkward age of being too old to be treated as a child but too young to be treated as an adult. At that moment we think it will last forever, don’t we? Holiday blessings to you and himself. Thank you as ever for your kind words.. it’s so good to know you’re still along for the ride !!! He is away for the day playing disc golf at a friend’s course by the sea… utterly glorious on a day like this … I could go too, except that idle chatter with idle wives is not my thing !!!! so just love from me !!! Gosh you have been reading a lot haven’t you !! !… it’s such an encouragement to have the sort of appreciation you so kindly give me.. Thank you so much, I love it ! No I didn’t keep a diary, but I do have what my partner calls an ‘eidetic memory’ – and remember not just events and people, but colours and smells and atmospheres… I can remember every dress, pyjamas, coat etc I’ve ever worn, with their textures and patterns, right back to two or three, and the same goes for all the clothes of the people I lived with… patterns on china, conversations, books,rooms,furniture, even to the page where something is written..
.I have to be very stringent about editing both events and details as I know my writing could become very boring and overloaded with unnecessary facts!!! My contemporaries in the family don’t believe half of what I remember, because they don’t !!!. From you starving as a child because you didn’t get enough to eat at home and then this excess of food, what a wild ride, Valerie! You have such a phenomenal memory! Lovely to hear from you as always Luanne… yes, a wild ride, and there’s more to come – you can see why food matters to me, even as a Threadbare Gourmet !!! Love to your wild child – himself !!!! At that particular age, how fascinating such a long voyage to Singapore and then its sudden newness of culture and landscape must have been to you! I believe there is an internal shift that occurs when one travels as a child that takes hold no matter what. Cheers to Elizabeth Kubler Ross, whose empathy and advice to dance and play I admire. Thank you, friend, so good to see your blog logo here and read your insightful comments as usual…! How clever of you to pick up that it was the Empire Trooper… I also knew people who had been on the Empire Windrush too, including two school friends who were on it when it caught fire, and lost everything they possessed… interesting times weren’t they !